I left the Capital on the very afternoon that the storm hit. It was just drizzling when I got on the outbound train and did not realise the magnitude of this storm until I was back in my hotel room watching the news that evening in Shijiazhuang. This was my second escape albeit a milder one compared to Hurricane Katrina back in 2005 where I flew out of New Orleans just a day before the hurricane hits The Big Easy. Anyway, not going to write more about the storm coz for starters, I wasn't there when it happened and besides, it's been covered to death by the media. What I want to write about is the day after where I hitched a ride from Shijiazhuang to ZuoZhou and then took a bus back into the Capital. 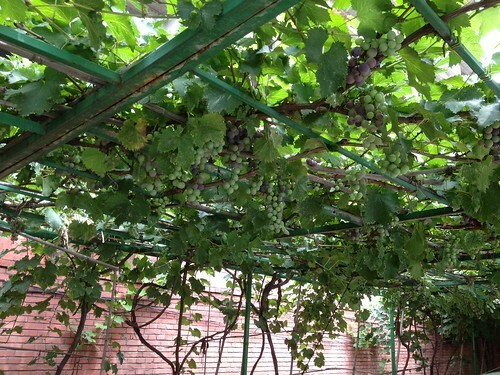 En route, I stopped by this restaurant where there were car park shelters that double as grapevines. There were overhanging grapes which I initially thought were fake rubber ones. Then someone plucked one of the fruits and put it into his mouth. Wait. You mean the grapes are real?? I was tempted to give it a try but I stopped short when I saw the layer of dust (and a massive dose of car exhaust thrown in) covering the fruits. In any case, I was glad to see the grapes survived the storm. Perhaps the rain here wasn't as severe as in the Capital albeit only 80 km away? 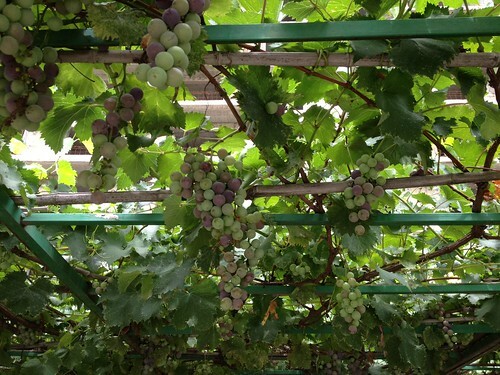 Another interesting thing I saw was that the bunch of grapes has got both white and red grapes. I thought white grapes and the whole bunch is white viz-a-viz red grapes and the whole bunch is red? Or perhaps a red grape has to go through the white phase before fully developing into a red? Or is it the other way round?